We came across this interesting video on YouTube earlier this week. It demonstrates a potentially dangerous problem for passengers traveling in balcony staterooms and suites aboard Oasis of the Seas. According to the video, it's very easy to lock yourself out onto the balconies. The poster of the video claims this happened to him. Luckily, he had his cell phone with him on the balcony, and the ship's connection was up. He called home, and they called Royal Caribbean's reservation office, and that office called the ship. Two-and-a-half hours later, someone came to his stateroom to open the door for him. As you can see in the demonstration in the video, if you accidentally move the door handle into the locked position before the door closes, it latches, and there's no way back in. This video was posted in April 2010, so this happened almost two years ago. We assumed Royal Caribbean would have corrected this problem, and they'd be quick to tell us about it. If that had been the case, this would have been just another lead that didn't go anyplace, and there'd be no story. We asked them if the latching mechanism had been modified to prevent this from happening. We also asked if any other ships (such as sister ship Allure of the Seas) use the same latching mechanism. And of course we wanted to know what advice they have for any passenger who may find themselves locked out on their balcony, especially if they don't happen to have their cell phone with them. We heard back right away, and they asked us to delay the story while they checked, so we did. We've kept asking for an answer to our questions, but all that we are now hearing is the sound of crickets chirping. If they had fixed the problem, one would think they'd want to be quick to tell us. Otherwise, it seems like maybe they are delaying giving us an answer which could prove embarrassing for them. So here's our advice if you are going to go out on any balcony. First take a few seconds and test it out. Next just be sure to take your cell phone with you onto the balcony. (Before you leave home, be sure that your phone is set up to make calls from the ship, and that you've put Royal Caribbean's phone number in your phone's address book.) If you get locked out, one thing to try is to call out to see if anyone else is on their balcony and can hear you. DO NOT try to crawl around the divider to another balcony or break the door. Both of these are extremely dangerous. If all else fails, realize that your cabin steward does come in to service your stateroom twice a day, and he can open the door, even though it might be quite a wait for him. We'll update this item if Royal Caribbean ever figures out what to say. Royal Caribbean tells us that getting locked out is not a common experience, but it does happen, so over the next three weeks they will be considering solutions to the problem. By the end of that time, they will decide on a permanent fix, and implementation will begin as soon as practical after that on both ships. Princess Cruises said today repairs on the propulsion system of Caribbean Princess will necessitate the cancellation of two additional sailings, March 18 and March 25, 2012. Caribbean Princess experienced problems with the port propulsion motor during the current cruise and returned to San Juan for repairs. Technical experts joined the ship in St. Maarten, and additional technicians met the ship in San Juan on Wednesday to begin repairs. It was anticipated that the repairs could be completed in time for the March 18 sailing, but after additional review, it was determined that damage was more extensive than originally believed. Hotel operations are not affected. Passengers from the current cruise may remain aboard the ship until Sunday, if they wish, so they can return home on their scheduled flights. Passengers on all three sailings are being given a full refund of their cruise fare and taxes along with a future cruise credit in the amount of 25% of the fare they paid. Passengers on the March 18 & 25 sailings are also being refunded their air fare and any transfers or hotel packages purchased. Princess will reimburse passengers who purchased air fare separately for any change fees they pay when rescheduling their flights. The next scheduled sailing of Caribbean Princess is now April 1, 2012. This Saturday may be a noteworthy day at Port Everglades. Then again, it may be just another busy weekend cruise day. On Saturday, March 17, eight large ships are scheduled to turn around at the port, and that sets the stage to have a record-breaking day for the most passengers ever through any seaport on a single day. 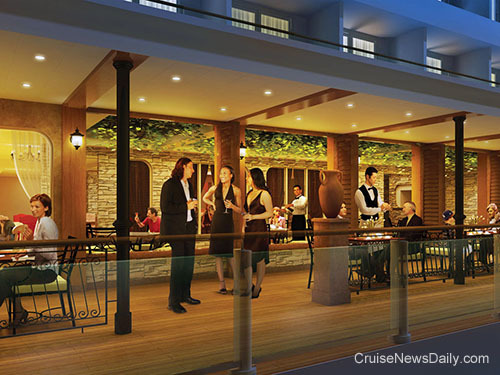 There will be a variety of restaurants and bars which open out onto the Waterfront. 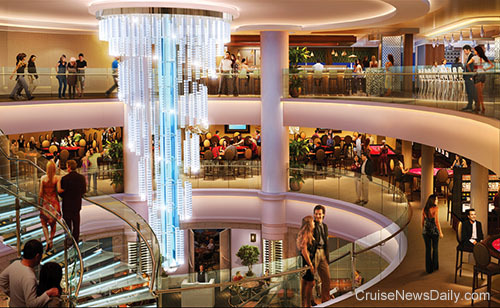 Another major design element of Norwegian Breakaway is a three-deck-high atrium called 678 Ocean Place that will have many of the restaurants, bars and amusement areas opening onto it. Some of the Waterfront's venues will run halfway through the ship so that they will open onto both the Waterfront and into Ocean Place. The casual Italian restaurant, La Cucina, is one of those venues with two "fronts." It has this "front" on the Waterfront with al fresco dining. La Cucina will also have a large indoor seating area. La Cucina's other "front" offers seating on a "terrace" overlooking 678 Ocean Place. The video below puts it all together with the walkthrough portions helping to demonstrate the flow from inside the ship to outside. The complete article appeared in the March 14, 2012, edition of Cruise News Daily. Propulsion problems with Caribbean Princess’ port propulsion motor have caused Princess to cancel the current sailing and return the ship to San Juan. Caribbean Princess departed St. Maarten this evening, and arrival in San Juan is planned for mid-day on Wednesday. Princess says the ship is fit to sail, and hotel operations are not affected. It just cannot sail at normal cruising speeds. Repairs will begin when the ship reaches San Juan on Wednesday. Passengers are invited to remain aboard the ship until Sunday if they wish, when they can take their previously-scheduled flights home. Princess will issue the passengers full refunds and a future cruise certificate. Princess says they will contact passengers on the March 18 sailing as soon as it is know how the repairs will impact that voyage (if at all). Princess reports that the ship arrived in San Juan today as planned, and repair work has already begun. As work progresses, they will have an update on when it will be completed and how it will impact the March 18 cruise (if at all). 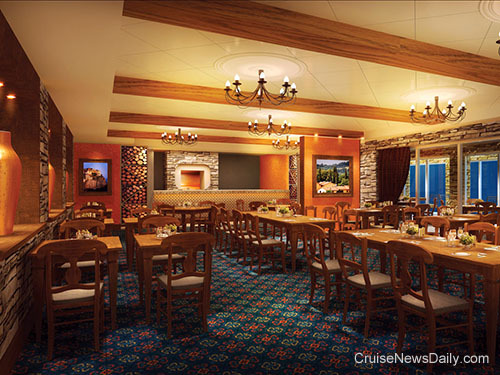 Princess Cruises revealed the dining venues aboard Royal Princess which will be delivered in 2013. 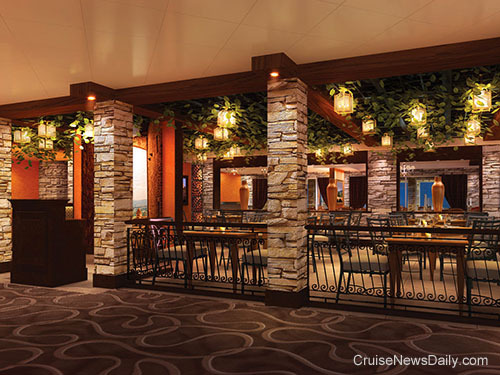 The dining venues aboard Royal Princess seem to be exciting evolutions of tried and true Princess staples, but they are going to take them to a new level that expands passengers options. Several existing popular venues will also now be paired in logical combinations aboard the new ship. A video about the new concepts is below. 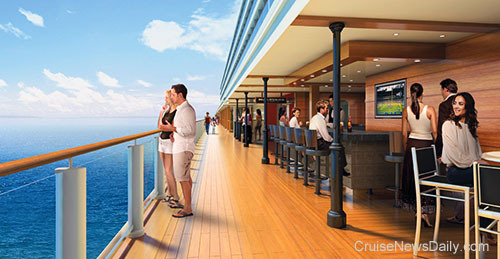 The complete story appeared in the March 13, 2012, edition of Cruise News Daily. STX Europe said this morning that they have entered into a contract with MSC Cruises to continue construction of the ship originally ordered by GNMTC, the start-up Libyan cruise line. The contract with GNMTC was canceled by STX in June 2011 when the Libyan company failed to make a scheduled payment. STX continued construction after the cancellation in anticipation that the hull would be purchased, and it was generally assumed that MSC would be the buyer. MSC said this morning the 140,000-vessel will be named MSC Preziosa (treasure). The 333-meter ship will have 1,751 passenger staterooms on 14 decks (18 decks overall). 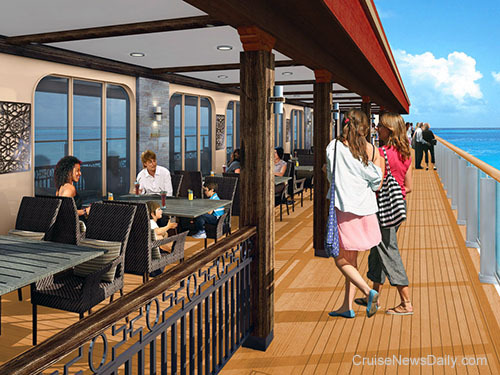 The ship will also feature 69 suites in MSC's luxurious Yacht Club in the private ship-within-a-ship area. Right now, total construction is 45% complete, and the mechanical zones are 70% complete. Interior fittings will begin shortly, and delivery of MSC Preziosa is scheduled for March 2013. MSC Preziosa will become the 13th ship in the MSC fleet, and the fourth in the Fantasia class, when it is delivered next year. 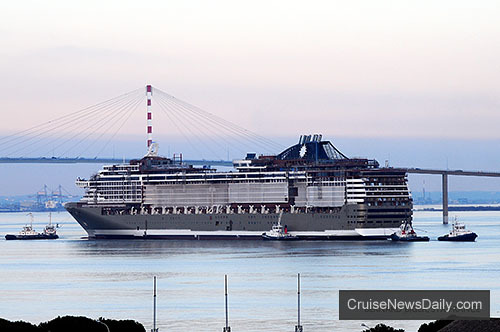 MSC Preziosa at float out at the STX France yard in Saint Nazaire. Ring. Ring. It won't be your shellphone ringing when you hear your ringtone aboard Norwegian Epic. It could be a call from your friends on the ship wanting to see if you can meet them for a drink, or it could be a text message from your kids explaining why they can't get back to the cabin in time for curfew. Allin Interactive has partnered with Norwegian Cruise Line to develop the free iConcierge app for many smart phones that will allow you to interact with the ship's guest information and service systems during your cruise. It will also let you call and text other passengers on the system during your cruise for one low price. For the first time, Royal Caribbean International will be homeporting a second ship in the UK for 2013 summer season. The 3,114-passenger Adventure of the Seas will begin sailing from Southampton in May 2013 alongside the 3,634-passenger Independence of the Seas which will return for its fifth consecutive summer season. CND subscribers also read about a helicopter medevac from Norwegian Jewel ... and how they can't sink The Love Boat.